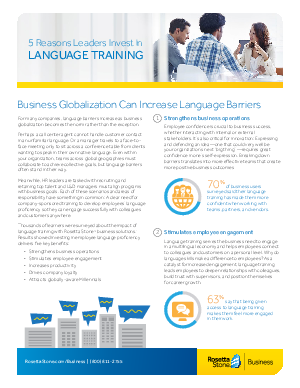 For many companies, language barriers increase as business globalization becomes the norm rather than the exception. Perhaps a call center agent cannot handle customer contact in an unfamiliar language. Or a manager travels to a face-to face meeting only to sit across a conference table from clients wanting to speak in their own native language. Even within your organization, teams across global geographies must collaborate to achieve collective goals, but language barriers often stand in their way. Meanwhile, HR leaders are tasked with recruiting and retaining top talent and L&D managers must align programs with business goals. Each of these scenarios and areas of responsibility have something in common: A clear need for company-sponsored training to develop employees’ language proficiency so they can engage successfully with colleagues and customers anywhere.